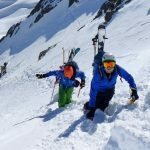 “A ski instruction course designed to improve your technical off-piste skiing, mountain safety awareness and skill, whilst doing lots of good skiing & touring in the process”. You will also hopefully be inspired to embrace a creative approach to your ski adventures in future and realise the potential for fun ski journeys with touring bindings, skins, map and a good plan! 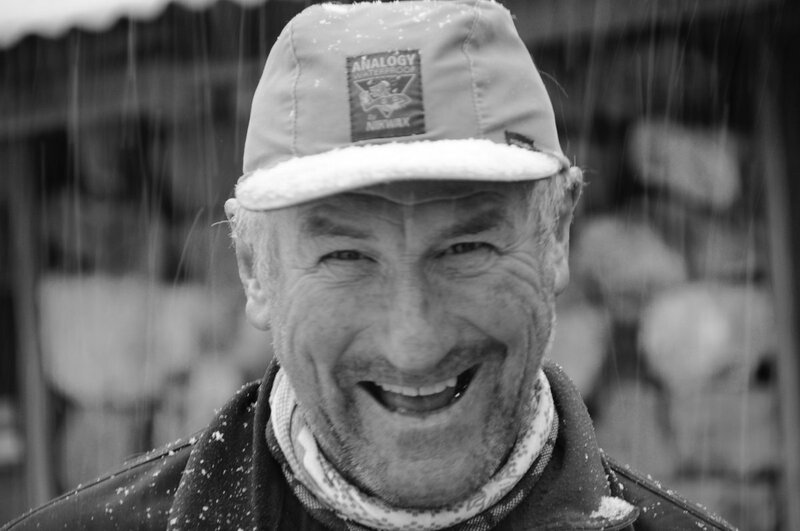 Most of these courses will be run by Alison Thacker (née Culshaw); BASI Ski Instructor and International Mountain Guide, Rob Jarvis. 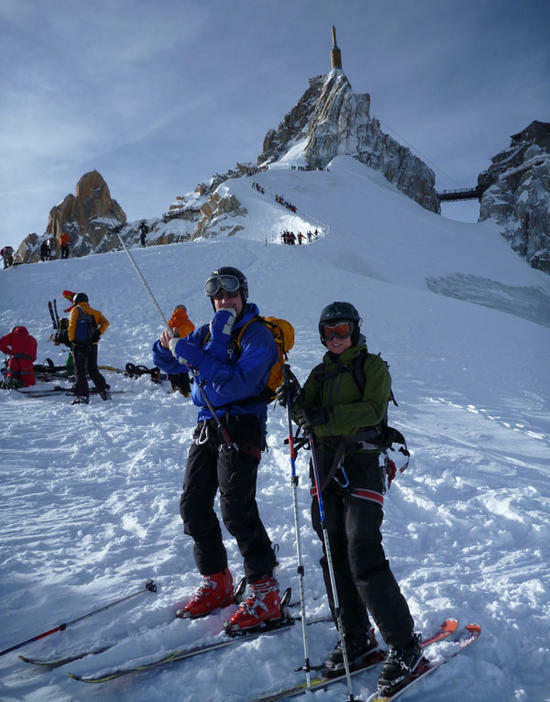 Alison Thacker & Rob have been running an active series of Chamonix Off Piste & Mountain Skills courses together since winter 2013, with some great feedback from our guests. 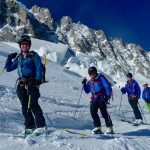 ‘Chamonix Off-Piste Ski & Mountain Skills is a joint venture between ‘High Mountain Guides’ and ‘Off-Piste Performance’ aimed at giving you expert adviceand coaching in all aspects of mountain skiing. 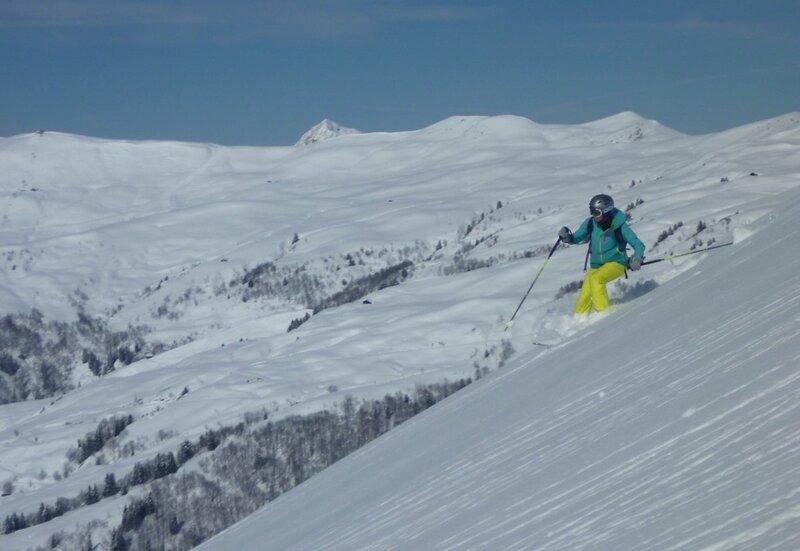 Alison runs ‘Off-Piste Performance’ and holds the BASI International Ski Teacher Award. 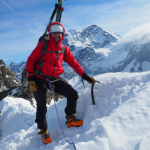 She has delivered Continuing Professional Development (CPD) to the British Mountain Guides and works as a trainer on the BASI Mountain Safety Courses training aspiring instructors. When not teaching skiing she’ll be off ski touring somewhere. Her most recent trip took her to the Lyngen Alps in Norway. 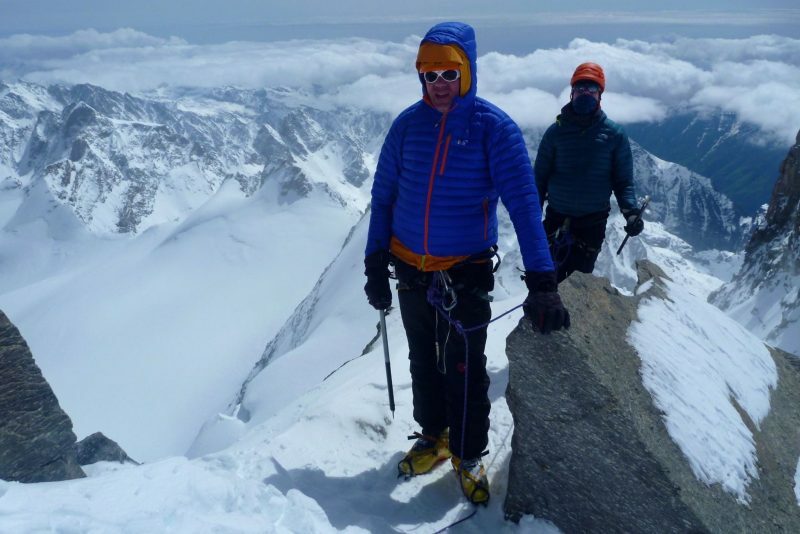 Rob runs ‘High Mountain Guides’ and is a full time Mountain Guide based in the French Alps near Chamonix. 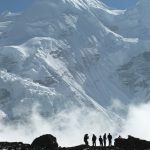 He has led mountaineering and ski expeditions around the world including skiing to the South Pole and, slightly steeper, Mount Vinson, the highest peak in Antarctica. A brief note of thanks for this week. It’s the best week’s skiing I’ve had. It was a great help to understand why we were doing and not doing certain things and how to minimise risk and maximise the potential for good skiing. I’ll recommend the course and your guidance to those who’d appreciate them. Alison will work with you to make the downhill become something you look forward to whatever the snow type. She will give you the tools to float effortlessly through the powder, embrace the bumps, control the hard pack, manage the ice and even enjoy the crust! You will gain tactics to ski smoothly through the trees, feel more confident on the steeps and have a strategy for when snow conditions are so poor you just need to get down the mountain safely. 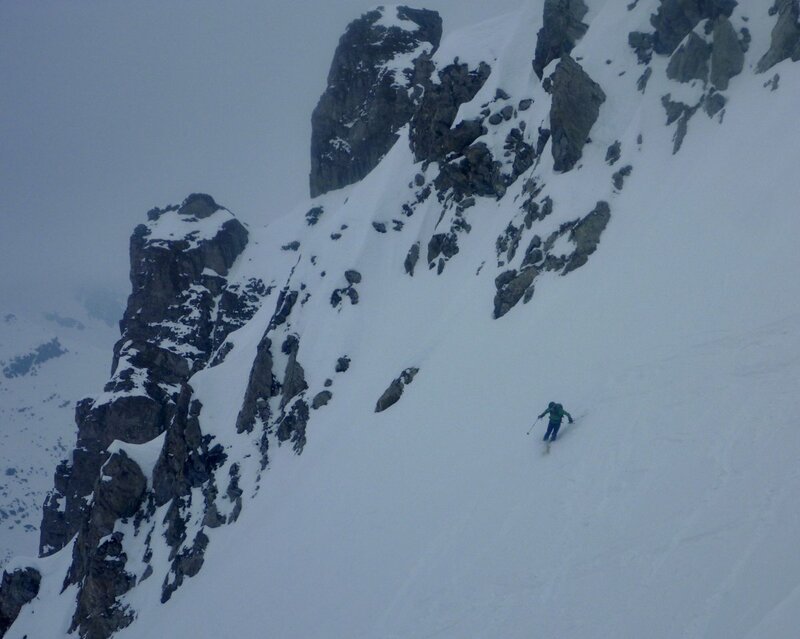 Our Classic course team enjoying fine powder touring conditions above the brilliant Arve Valley ski station of Combloux. 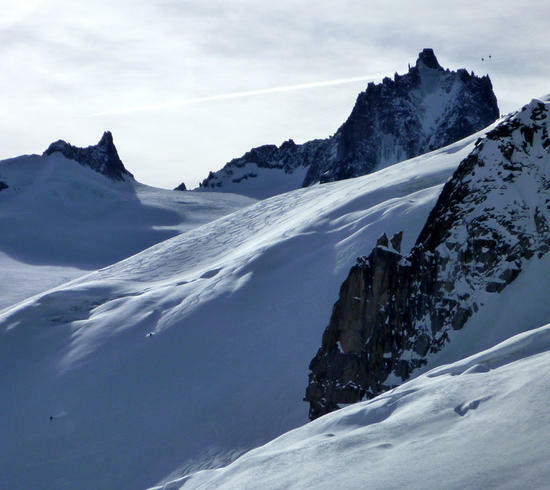 A favourite location for intro ski touring and now on the Mont Blanc Unlimited Ski Pass. By ascending on skis, using skins, untracked slopes can be reached or a quiet summit view enjoyed away from the crowded pistes. The pleasures are great but the hazards are real. 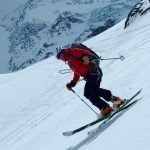 As an international Mountain Guide, Rob will not only deliver these practical skill sessions but constantly ‘drip-feed’ information about the constant decision making processes involved in off-piste skiing and ski touring. 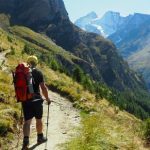 You should finish the course with a much greater awareness of the issues involved in planning your own off piste & ski touring journeys and a good simple framework to use for planning your own routes. 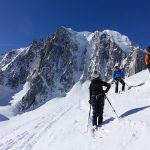 Superb powder descent of the Vallee Blanche – training both off piste technique and glacier skiing principles at the same time on our Feb classic course. This suggested itinerary may vary considerably according to weather and snow conditions. Arrive in Chamonix. Arrange all ski equipment & warm up skiing. 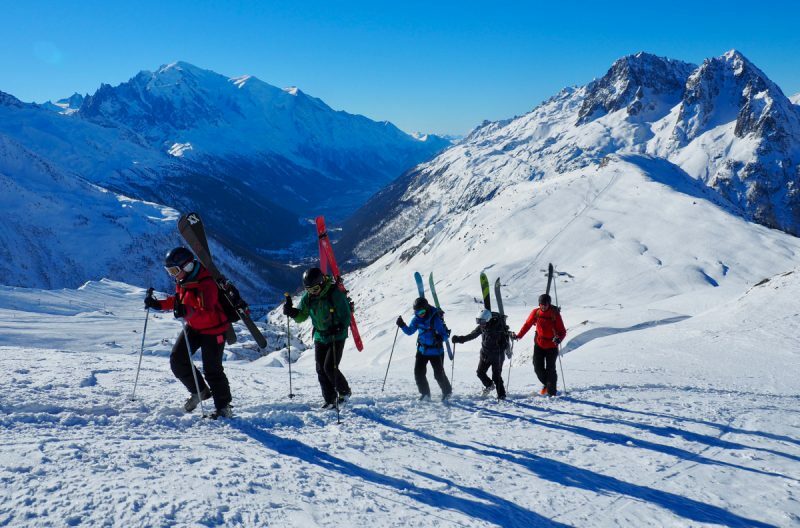 As with all our ski courses, we recommend you prepare as much as possible in advance with relevant ‘ski fit’ preparation and then arrive at least a day or two early to both warm up your ski legs & check equipment. This is especially important if you will be renting boots or skis & bindings. Please also make sure your skis are well serviced & bindings correctly adjusted. 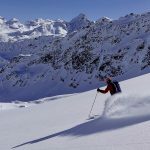 Introduction to Off-Piste Skiing with Alison looking at the fundamental skills needed for being effective in the off-piste. Feedback will be specific to the individual so that you have personal top tips to take forward into the week. 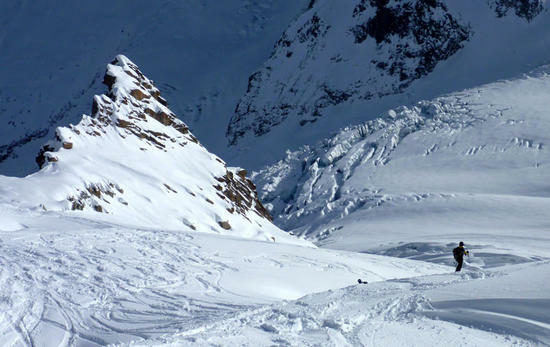 Off-Piste Ski decision making in ‘avalanche terrain’, use of avalanche equipment and Emergency procedures. Efficient use of skins for ascending on skis. 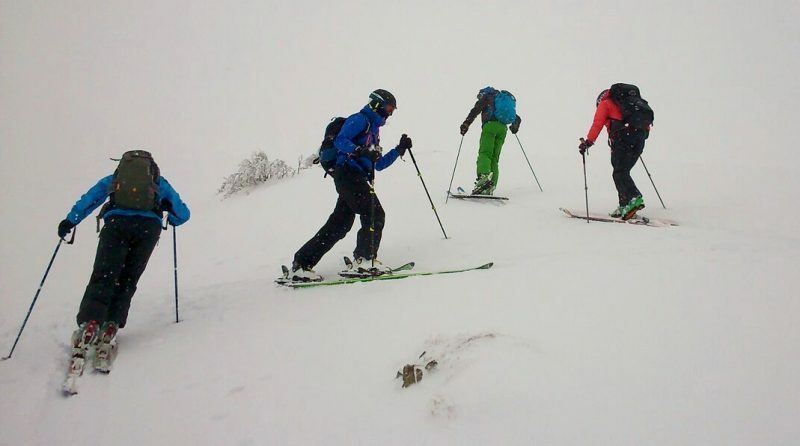 During this day you will apply the skills learnt on day 1 to whatever the off-piste conditions are. Whether it is powder, icy or bumpy (or a mixture of all of the above!) you will have plenty of time to put the skills into practice. 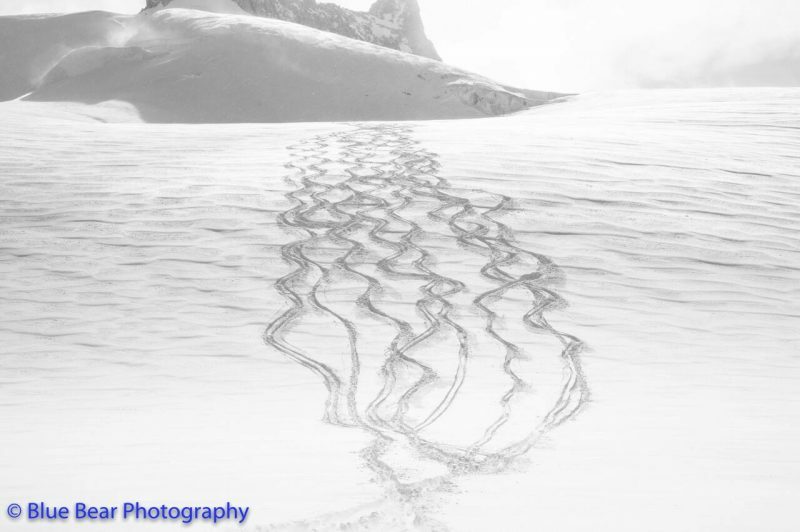 Weather permitting, this day will be a glacial ski journey covering aspects of safe travel in crevassed terrain. 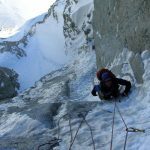 Roping up, route finding and basic crevasse rescue techniques can all be covered whilst enjoying a magnificent journey down one of Chamonix’s famous glaciers like the Argentiere or Vallee Blanche. 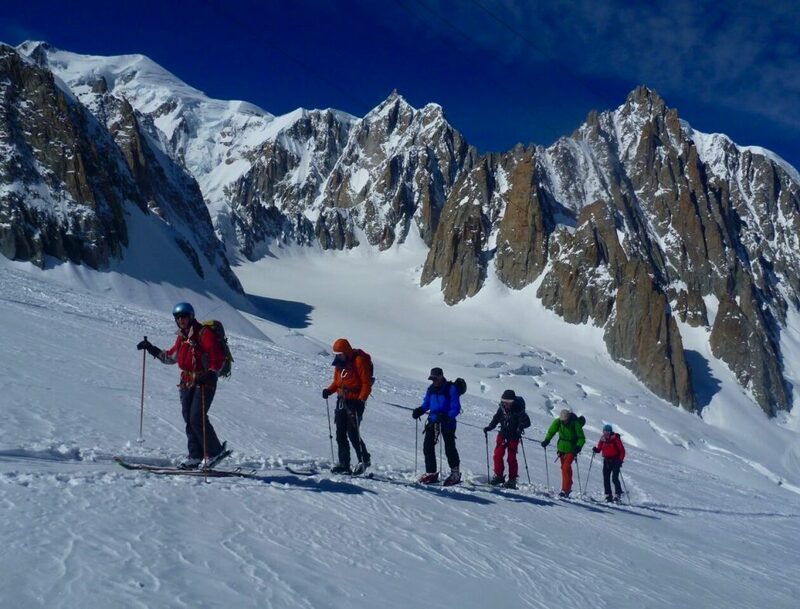 High altitude skinning journey heading over to the Italian side of the Vallee Blanche from the Chamonix side. 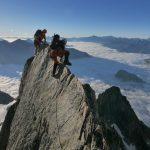 A brilliant high alpine tour we often do on the classic course. Hi Rob, Alison, Thanks for a great course. I loved every minute of it. I also learned a great deal. I definitely feel I was skiing better at the end of the week. Now I just need to remember it all for next year……Enjoy the rest of the season, Norway etc. I’m not jealous. Really. Since 2013 these courses have been a complete sell out so book early to ensure your place in 2018. 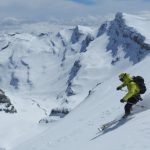 For Winter 2020 we have both classic and progression courses running throughout the season from the powder tree skiing in January to high mountain touring in April. So choose your course, choose your month & get in touch to book your place! Lift passes. The ‘Mont Blanc Unlimited’ Ski Pass now has such good coverage including all the Chamonix lifts, Courmayeur and even the nearby Aravis / Megeve / St Gervais areas that we ask you to buy this pass for the duration of the course. This means that you will then not have to buy a lift pass each morning and we have good flexibility to use any lift as weather & snow conditions dictate. Occasionally we do a ski tour away from the lifts and thus a pass is not required for a day or 2 but this is not possible to determine at the start of the week and thus overall we have found the best solution is to buy the MB Unlimited Pass. Ski Equipment. 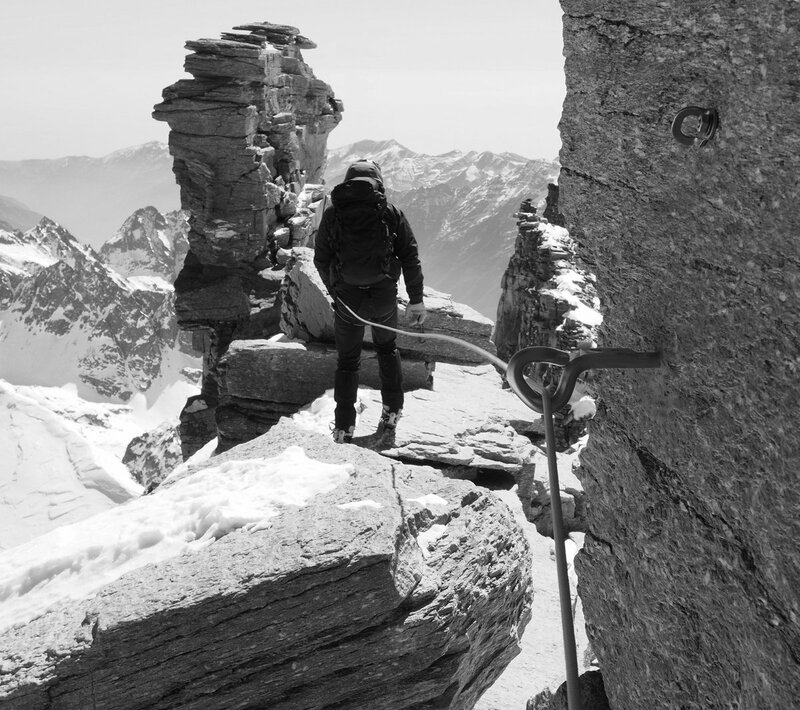 Check the course – Chamonix off piste & mountain skills equipment list. 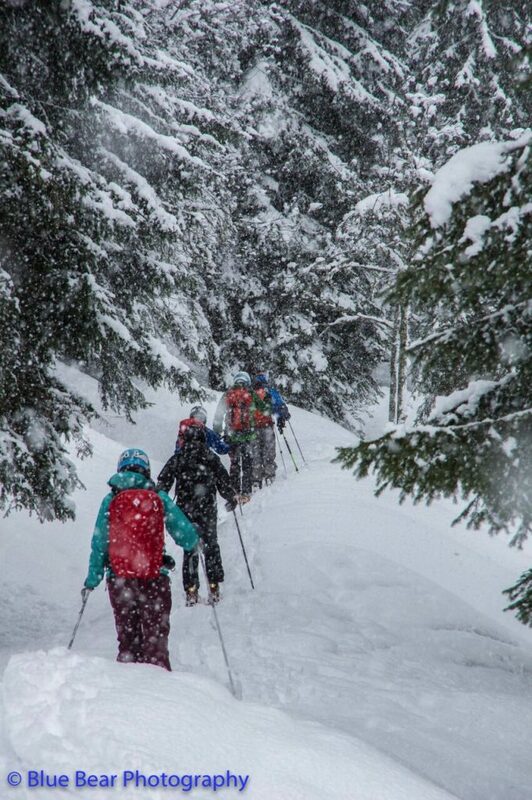 Snowy powder touring below the tree line on the Vallorcine side of Le Tour, another favourite venue for our combined off piste and touring journeys with training along the way. Thanks! Great experience , really glad we did the course again. Retained so much more than first time around. Not too sure we should have repeated the Friday night out ! I am sure we will see you both again next year. 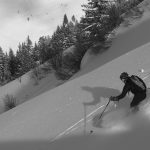 To get the most from this course you will be a strong piste skier and be able to get down all groomed slopes with confidence. You should also have existing off-piste experience and be reasonably competent descending in a variety of snow types from powder to crust! 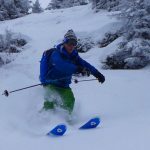 Instruction & coaching will be given as part of the course and the aim is to gain confidence and skill rather than ski particularly steep slopes. 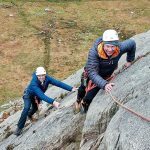 We have found that people really enjoy this course when they have done lots of off-piste mileage but never quite got the hang of it. Or if you are able to rip it up in the powder but feel you only have “one skill set in your tool box” so struggle to make changes to adapt to the changes the off-piste environment throw at you.. 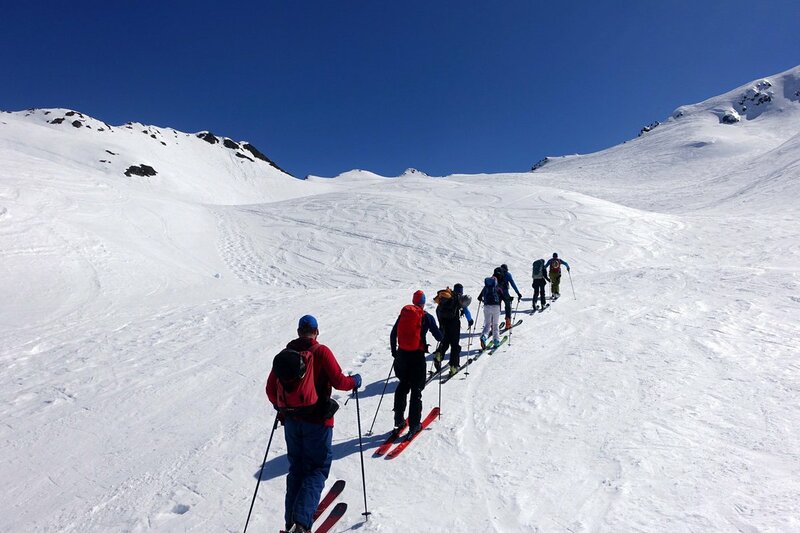 These are group courses and you will need to embrace this important element of the week and the important team aspect of off piste skiing and touring. 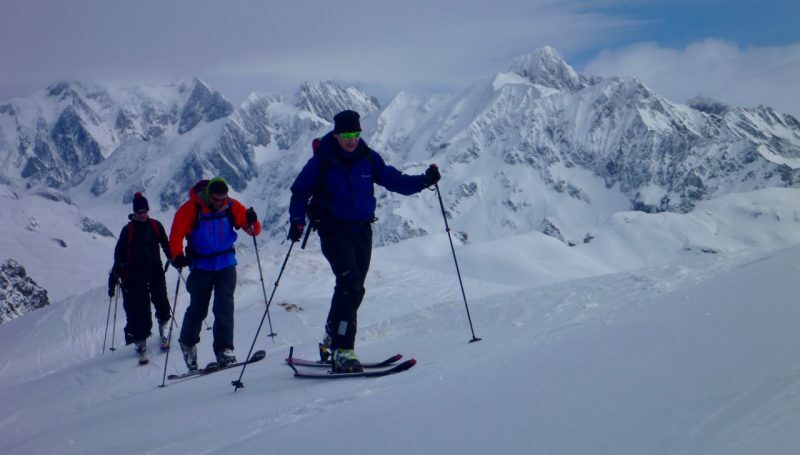 If you are keen to maximise your time in terms of individual ski coaching, or completing longer / more physical tours then we recommend Chamonix private ski guiding. 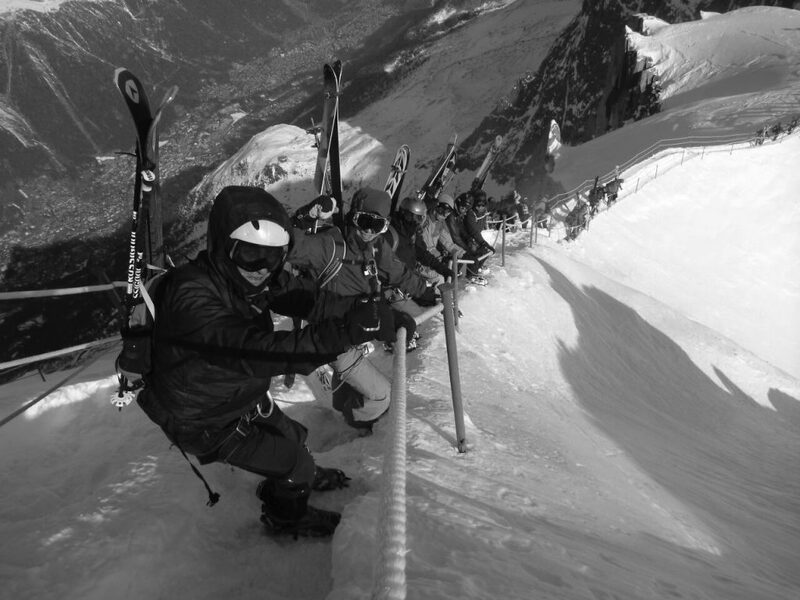 Full course team descent of the Aiguille du Midi snow arete, equipped here with fixed ropes. 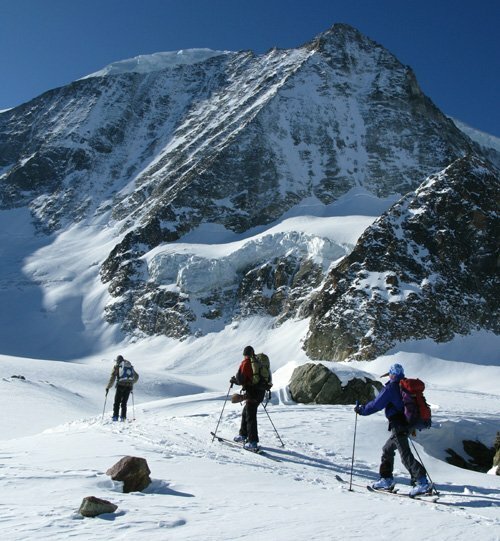 An ‘interesting’ experience for many skiers and putting the M factor into ski mountaineering! 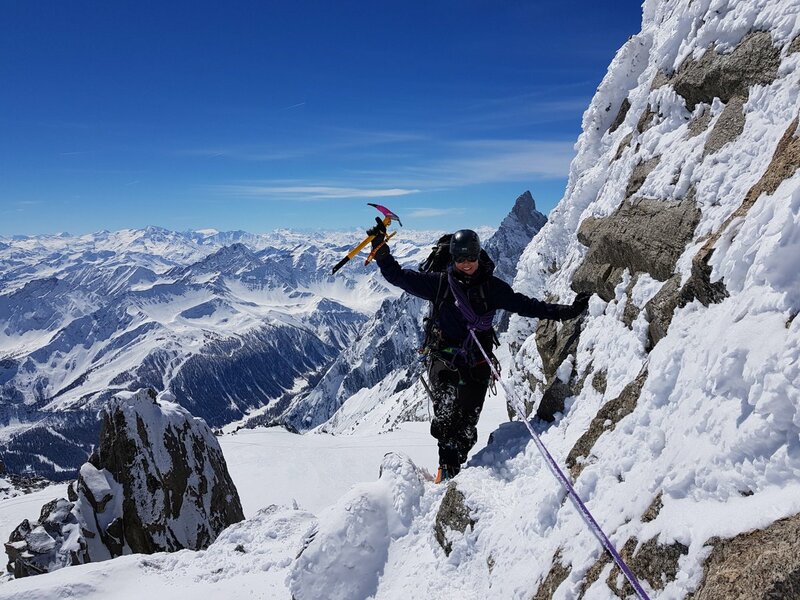 The progression course will also be run by both Alison Thacker née Culshaw (BASI ISTD Ski Instructor) and Rob Jarvis (IFMGA International Mountain Guide) unless we have a 2nd course running which will be led by a carefully chosen pair of fully qualified ski instructor and mountain guide. 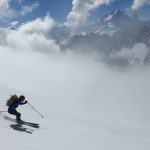 Although you will already be a good off-piste skier, Alison will work with you to develop more confidence on steeper or more technical ground and give you techniques and tactics for when conditions are tough. With lower ratios than the standard course, this tuition will be even more tailored to your individual needs. Time can be spent working on those individual habits that you have always been trying to change. 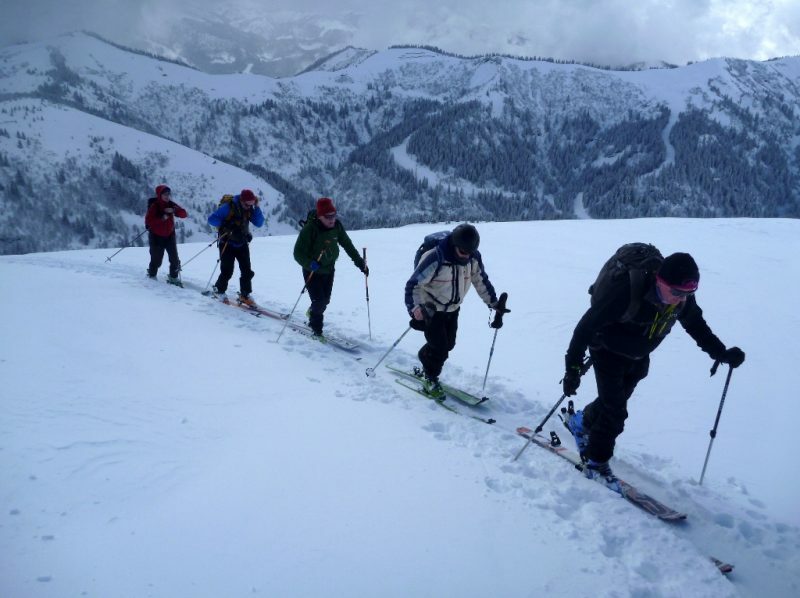 Alison has experience of delivering these skills to skiers from beginner to mountain guide and other ski instructors. She will analyse your own skiing style and coach the improvements accordingly. Check out some feedback from Alison’s previous ski clients here. 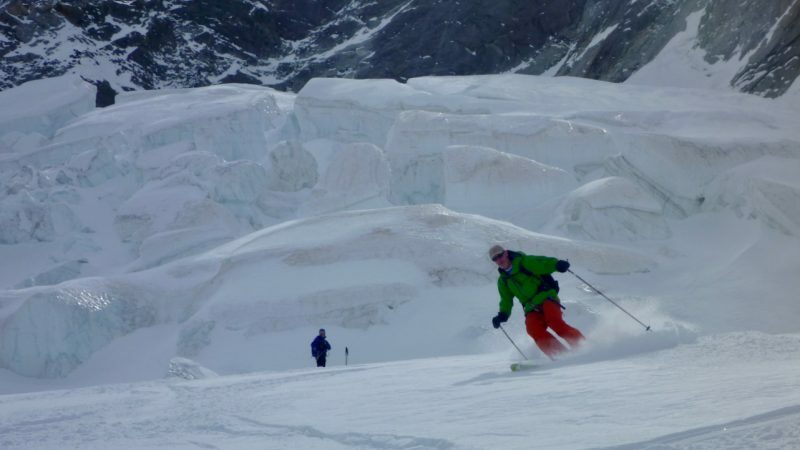 Over the 2 days you will feel your skiing becoming more efficient in challenging situations. 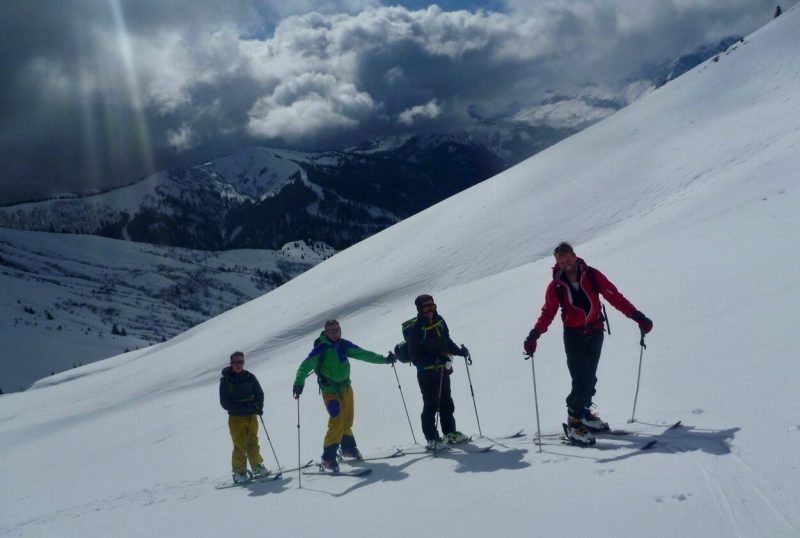 Team ski touring away day in the Aravis. 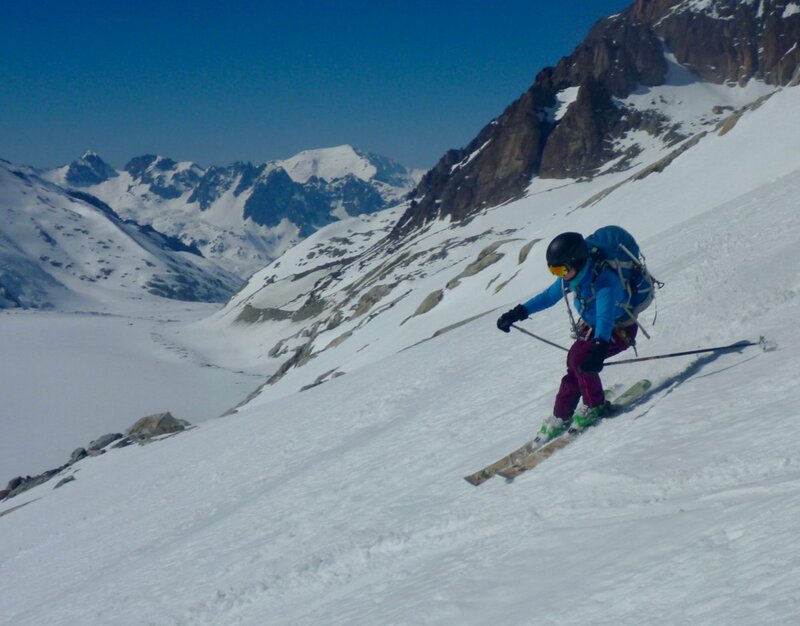 On our progression course we aim to do a physical touring day and a more technical / glacier skiing day along side the off piste coaching days. 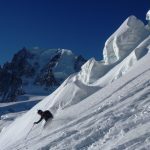 A solid & reliable ski touring kick turn is a pre-requisite of this course to enable us to visit some of the classic steeper ski mountaineering terrain around the Mont Blanc Massif. 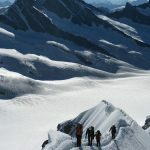 Touring in these areas under the supervision of an IFMGA Guide will help you develop further your technical ski touring skills including efficient transitions, glacier skiing, the use of ski crampons and perhaps even boot crampons, ice axe and rope if conditions / team ability allows. Those looking for more technical tours and steeper terrain should check out our advanced course. 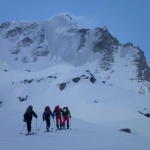 Throughout the progression course, attention will be given to prevailing snow conditions, weather and avalanche forecasts and developing your ability for information gathering, planning suitable routes & making good decisions about terrain to ski with the two fundamental aims of…being safe & having fun! 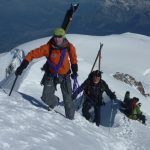 As well as these training & technical elements at least one of the touring days will be a long & physical ski tour to give the satisfaction of completing a grand high level mountain ski journey. 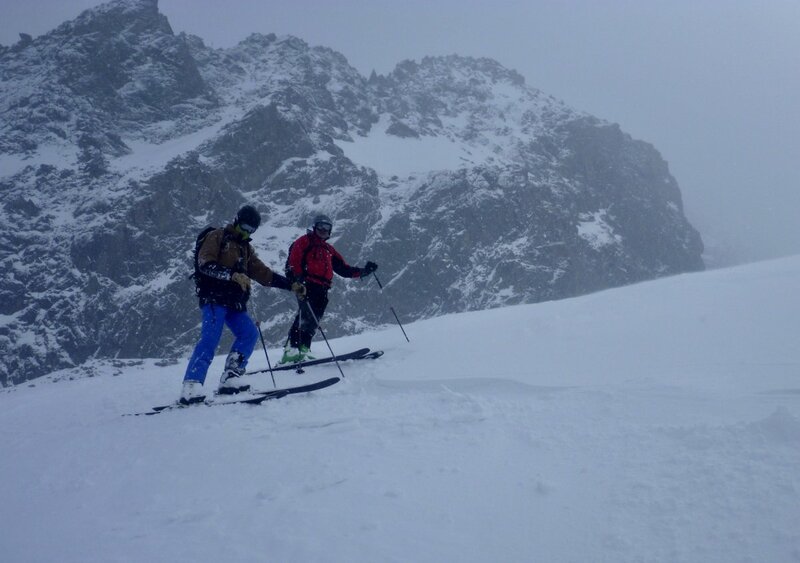 Team kick turn training in tough touring conditions….skinning in goggles….lets find some better viz to ski down in! Just had an excellent two days’ tuition from Alison in a mix of conditions right down to absolute zero vis. So when better to be told to slacken off your boots and ski by feel? And it works. 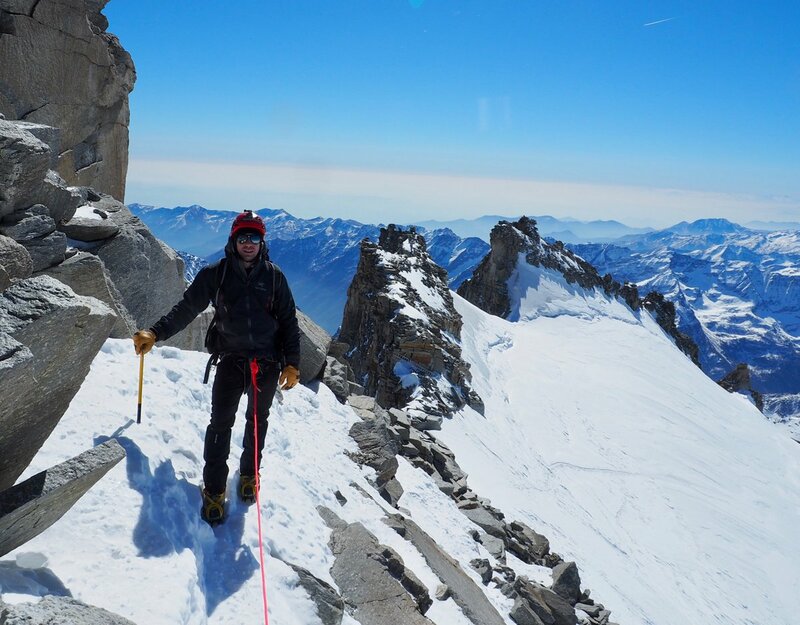 This is my second set of lessons with Alison; she’s very good (actually far better than that), and our thirty-year experienced mountain guide was also raving about his lessons with her. Competent, confident, robust and reliable skills whilst skiing any pisted run and off-piste in all conditions on slopes up to 35 degrees. 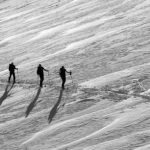 You will have already completed at least a week of ski touring and be competent performing kick-turns on steep & sometimes exposed terrain. 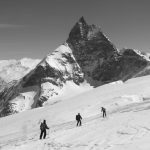 You will have practised regularly with your avalanche transceiver and generally be a competent member of an off piste / ski touring team. 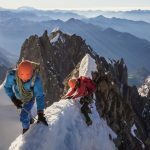 You’ll need to be able to cope with 4 full mountain days and have the fitness & stamina to maintain an ascent rate of at least 300 metres per hour for 3-4 hours and still be able to then make a safe and reasonably stylish ski descent! These are group courses and you will need to embrace this important element of the week. 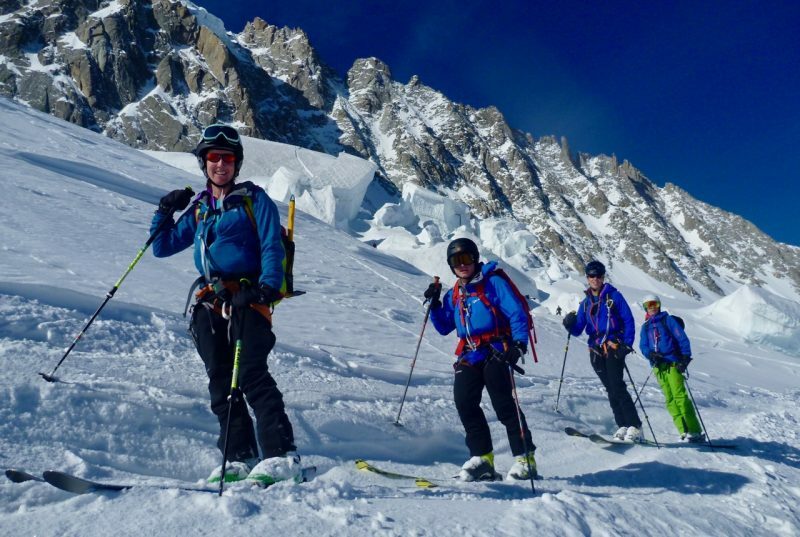 If you are keen to maximise your time in terms of individual ski coaching, or completing longer / more physical tours then we recommend Chamonix private ski guiding. Basic mountaineering experience with some previous use of crampons & ice axe is useful but not essential. 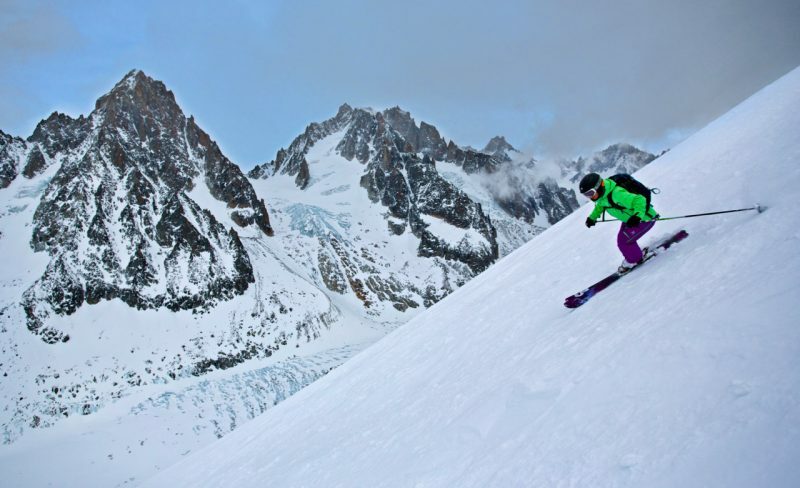 We recommend that you do some warm-up skiing before this course, ideally at altitude and with some skinning and kick turn practice if required. This is a demanding course and you need to be physically and mentally prepared for it. 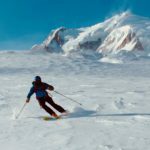 Unless you are a strong ski mountaineer already, this course is most suited to folk who are skiing quite regularly during the season. 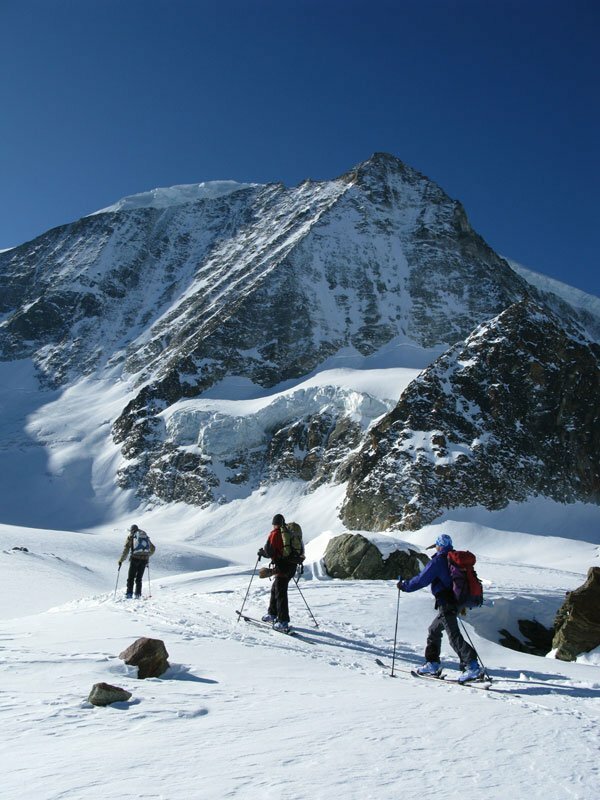 A short section of scrambling ridge is practised in crampons as part of a ski mountaineering approach and touring day. Arrive in Chamonix, enjoy at least one day’s pre-course warm up skiing & check all off piste & touring gear is working well. Away day ski mountaineering in the Contamines Valley with lots of good terrain covered using kick turns, ski crampons and some fine skiing. …the course, great stuff! I felt the techniques and analysis you you showed me helped me a lot. My confidence has gone up and there were several eureka moments! I also feel I am in a position to be able to criticise my own technique and identify where I am going wrong ‘on the hoof’. Lift passes. As we will use the best place for the day depending on the weather and snow we ask you to leave buying your pass until the first morning of the course. 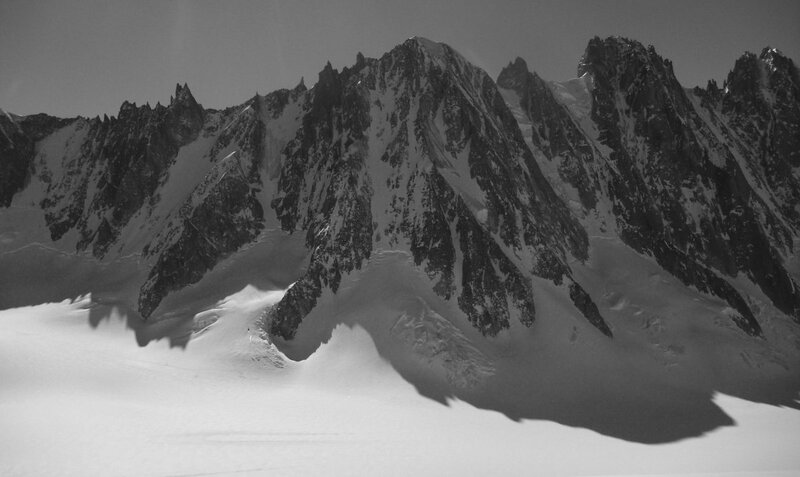 Cost of a day pass in Chamonix is max C.60 Euros and any other venues we use will be cheaper than this. 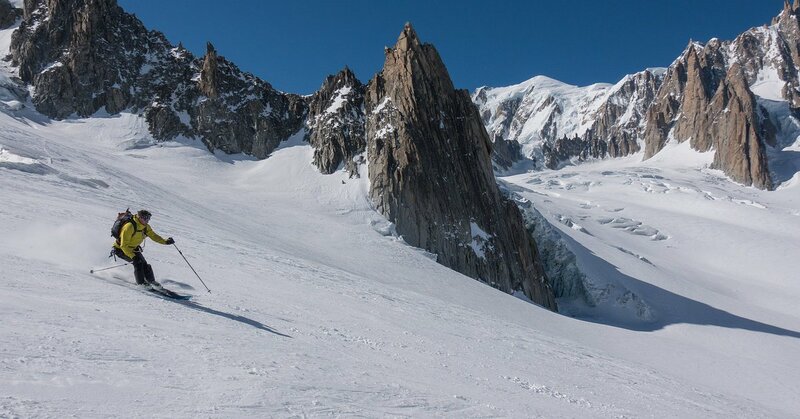 For folk skiing before & after the course, a good simple option is to buy a Mont Blanc Unlimited Pass for the duration although we may do a ski tour away from the lifts on one day and thus that days lift pass would not be required. Ski Equipment. Check the ski course kit list. Hi Rob and Derek, Just wanted to say a big thank you, I really enjoyed the course last week and thanks for taking us to the most stunning places. I really feel like there’s a whole new world of skiing out there, thanks for being so relaxed and easy to learn with and thanks for the great pictures. Have a great rest of the season, looks like good snow yesterday! Amy Sergison. Thanks for being part of a great week. Really enjoyed spending time with you in the mountains and getting your input into skiing in the mountains. It was a relaxed, informative and enjoyable time. Hope to see you around and possibly do some more skiing with you. Ian Carter. Hi Rob, Quick note to say thanks for some great skiing this week. We really enjoyed and and learnt loads. Slainte, John Appleton. 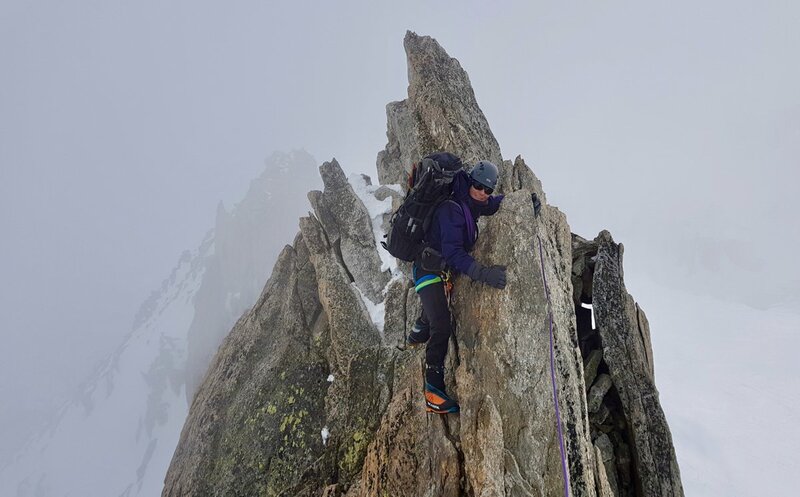 Booting up to the Tete de Balme, Chamonix on our January 2019 Classic course. The course was great, thanks, even if the weather was pretty crap half the time – story of the 2018 winter though! Both Mark and Blair have a really good way of explaining things and breaking them down – Blair’s tips in particular were super useful. No mean feat teaching a self-taught old dog new tricks! Pretty sure the group overall had a great time and everyone’s planning further courses, tours, instruction etc. Russell and I wanted to say thank you for a great week of instruction and guiding in Chamonix. We both got a lot out of the course and we also very much enjoyed our two days with John at the end of the trip. Not to mention understanding the uses of ski crampons! Please could you pass on our thanks to Derek, Neil and John for all their help? Thanks again, and all best.